The main story should explore the resurrection of the Lords of Cinder. Remember that the first divine being to give the guy was Gwyn, the frightening final boss of the original Dark Souls. Although little information has been shared about the plot so far, the first gameplay trailer, released during the Gamescom 2015 made it clear that the creatures are huge and macabre. 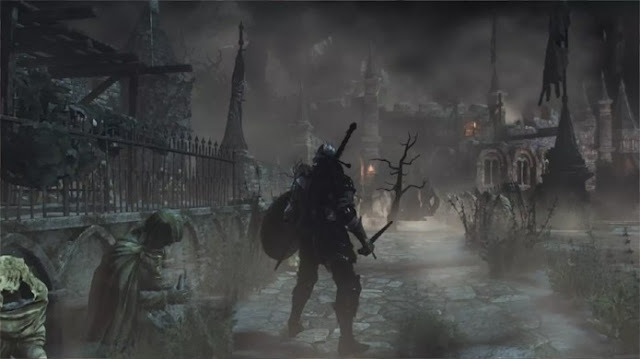 The resounding success of Bloodborne Miyazaki did implement some unique elements in Dark Souls 3 for PlayStation 4. This means that we will see more rapid and aggressive enemies’ combat system, although the shield remains an essential weapon for survival. The director ensures that Dark Souls 3 will continue with the characteristic essence of the franchise, though some specific changes should be made to streamline and diversify the gameplay. The possibility of modifying the shape of the weapon during battles is a nice feature inherited from Bloodborne, which will also be present to bring significant changes to the gameplay. As previously mentioned, the shield will remain an essential item of the day, but you must replace it in the course of gambling. That's because certain enemies will require advances that favor aggression, while other creatures will test the patience of the player in cautious strategies. The combination of weapon and shield will work on occasion, but maybe the character cannot reach the end of the journey with the same equipment. Long-distance weapons will also receive special treatment and, therefore, you can use a bow, for example, to deliver short-range attacks - almost like a blow body-to-body. Guns don’t have a single purpose. In Dark Souls 2: Scholar of the First Sin, the reissue of new generation of the second title in the series, was smarter opponents, well placed in scenarios and in larger flocks. According to Miyazaki, Dark Souls 3 will also follow the same path because there will be more intelligent creatures, able to study the movement of the player to know their weaknesses. Enemies will be hidden to surprise the hero and, moreover, will not act until they have the certainty that the character will be properly struck. As in re-mastering the second game, Dark Souls 3 will support up to six players in multiplayer mode. However, this time the From Software will invest in dedicated servers to avoid unbalanced matchmaking system. Finally we get to play with friends without having to wait for long minutes. The From Software managed to bring Dark Souls 2: Scholar of the First Sin in smooth 1080p and 60 fps in the new generation of platforms, ensuring an absurd fluidity to the game, while Bloodborne hit 1080p and 30 fps. According to information from the Japanese company, Dark Souls 3 will run at 30 frames per second, to ensure the good experience in all the islands, and in any situation. Even running at 30 fps, the game should introduce beautiful environments that established the series. Despite Namco Bandai have shared the information that this would be the final episode of the saga, it's likely that From Software work with a new story or even spin-offs in the coming years. Indeed, Dark Souls 3 will mark the conclusion of the journey and explain the mysteries of the previous two games. As a result, new gaps should be open to future titles of punitive series.